Members of the 2018 Lynchburg-Clay Cross Country team pose for a team photo at Lynchburg-Clay Middle School. Pictured (l-r): Cole Parker, Dawson Osborne, Austin Leininger, Austin Barnhill and Maelynn Quigley. Not pictured: Casey Barger, Samantha Kirby and Raelynn Ruble. Lynchburg-Clay’s boys and girls cross country teams enter the 2018 season in flux and will have a total of eight runners this season. Snyder will rely on the three seniors on the team to lead the runners this year. The 2018 season will be used to gain experience and confidence for the younger runners while trying to ensure that every member of the team is able to meet his or her goals. “I think a successful season for us would be one where each athlete meets their personal goals as a runner, and that we gain experience that will benefit the program going forward,” Snyder said. Snyder is extremely proud of the student-athletes on her team and believes that is the biggest strength of the team in 2018. “Our strengths are the quality of student-athlete our runners are. These are great kids who are active in so many things, and very well rounded. Our weakness would likely be our lack of experience,” said Snyder. The Mustangs have set achievable goals for themselves in 2018 and Snyder will measure the success of the team based on those goals. “Each of our runners has set personal goals they would like to accomplish. I believe that if they are successful at reaching those goals, our team goal of improving on our Southern Hills Athletic Conference standing from last year will become a reality,” Snyder said. Snyder appreciates the support that her team and all the Lynchburg-Clay teams receive from their fans and invites anyone to come see a meet in 2018. “The Lynchburg-Clay community always supports their student-athletes and their teams. Our home invitational is always well supported and we really appreciate that. I would definitely want to invite anyone, especially if you are not familiar with Cross Country, out to cheer on our runners,” said Snyder. August 29 – Lynchburg-Clay will open their season with the home invitational. September 18 – The annual Highland County meet will pit the Mustangs against the other four Highland County schools in a meet that will determine cross-county bragging rights for the next year. October 13 – The Mustangs will take part in the SHAC meet at Ripley High School as they try to improve on their finish from 2017. Lynchburg-Clay will need to set and surpass personal goals in 2018 to have the opportunity to compete in a loaded SHAC Cross Country field. Expect the Mustangs to put their best foot forward at every meet and compete until the very end. 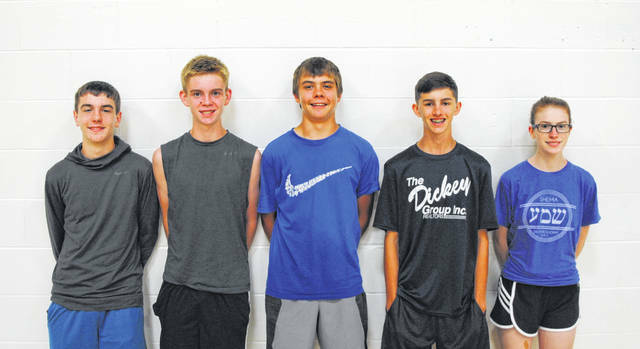 https://www.timesgazette.com/wp-content/uploads/sites/33/2018/08/web1_Lynchburg-CC.jpgMembers of the 2018 Lynchburg-Clay Cross Country team pose for a team photo at Lynchburg-Clay Middle School. Pictured (l-r): Cole Parker, Dawson Osborne, Austin Leininger, Austin Barnhill and Maelynn Quigley. Not pictured: Casey Barger, Samantha Kirby and Raelynn Ruble.